This is your essential step-by-step guide for how to cook bacon in the oven. Now you can cook bacon without the mess, whether you like it chewy or crispy! 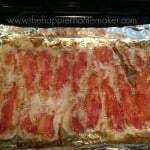 This post about how to cook bacon in the oven, my friends, is a post bred from necessity. If you follow along on Facebook you may have seen that I posted that my bacon turned on me. In our house I cook a full breakfast on the weekends, and I was cooking bacon a few weeks ago and the grease popped and I ended up with a pretty decent burn on my face. I still have a scar on my cheek. Fun times. 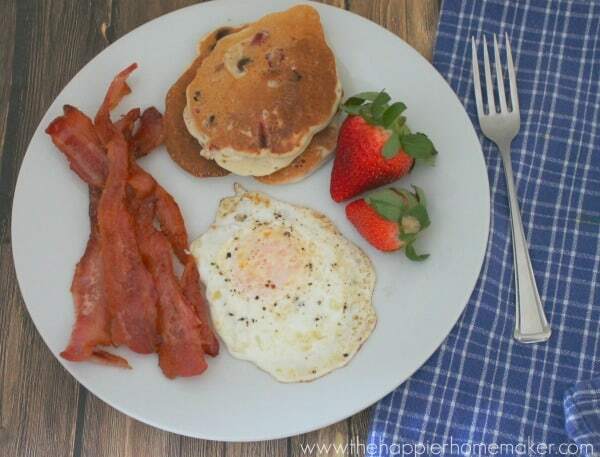 After perfecting this baked bacon recipe I doubt I’ll go back to the skillet-it’s easy, mess-free, and totally simplifies my breakfast routine! To start DO NOT preheat your oven! Seriously, start that sucker off cold! All you need is a baking sheet and aluminum foil. 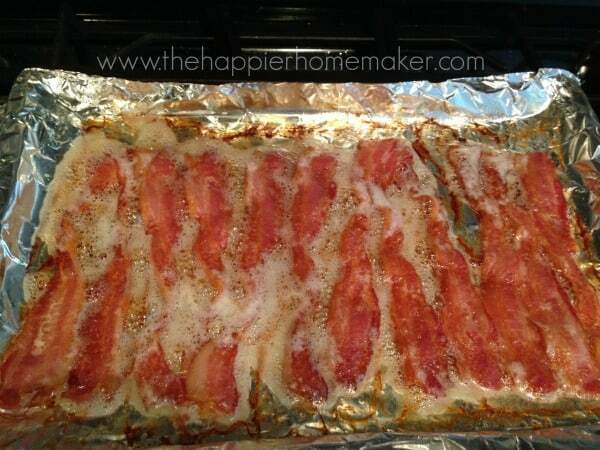 Line the baking sheet with foil (to contain the grease) and lay out your bacon in single layer. My baking sheet holds one package of thick cut bacon on one baking sheet. Put the baking sheet and bacon in the oven and turn it on to 400 degrees. For my thick cut bacon the cook time was 24 minutes from turning on the oven until the bacon was perfectly cooked. If you use thinner bacon it will be less and turn out more crispy. I keep my oven light on and keep my eye on it from about 16 minutes on. You want to take the bacon out of the oven when it is golden brown and not yet crisp for softer baked bacon. When you remove the bacon from the oven place it on a paper towel covered plate to drain excess grease and enjoy perfectly cooked bacon! I love that you can just throw away the foil and the cleanup is over! To make your bacon more crispy when baking it in the oven, you have a few options. Like I mentioned earlier, you can buy thinner cut bacon for baking. You can also line your baking sheet with foil then place an oven safe cooling rack over the top. (NOT the kind with a nonstick coating). Bake as described above, again, keeping an eye on the bacon after about 16 minutes to make sure it doesn’t go from crispy to burnt! Baking bacon in the oven is an easy way to simplify meal prep as well. Keep pre-cooked bacon in an airtight container in the refrigerator for up to one week. I like to cook up an extra package on Sunday when I’m making breakfast to use for the week. Then my husband or kids can make a fast breakfast sandwich on those busy weekday mornings. I also like to chop it up for my salads or add to a BLT for lunch! To reheat the bacon simply wrap the bacon in a paper towel and reheat for about 5 seconds! 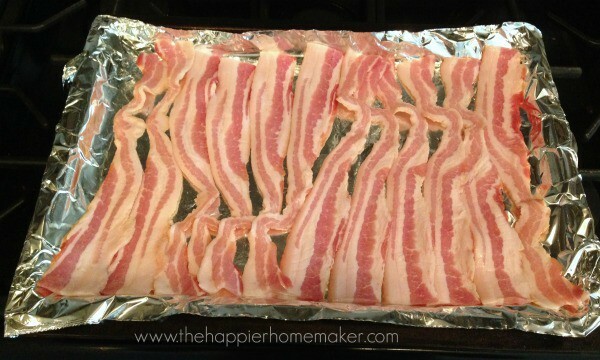 Lay bacon flat on the foil without overlapping. Place bacon in a cold oven and turn to 400 degrees F.
Bake for 16-24 minutes depending on thickness and desired crispiness. For crispy bacon use thinner cut bacon or cook on a nonstick cooling rack. Keep a close eye on bacon after baking for 16 minutes to ensure it doesn’t overcook. Have you tries baking your bacon yet? Or, can you commensurate with a bacon-inflicted injury too? if you put them on cookie racks you get less fat and crisper bacon. Use a silpat or parchment paper to stop sticking. 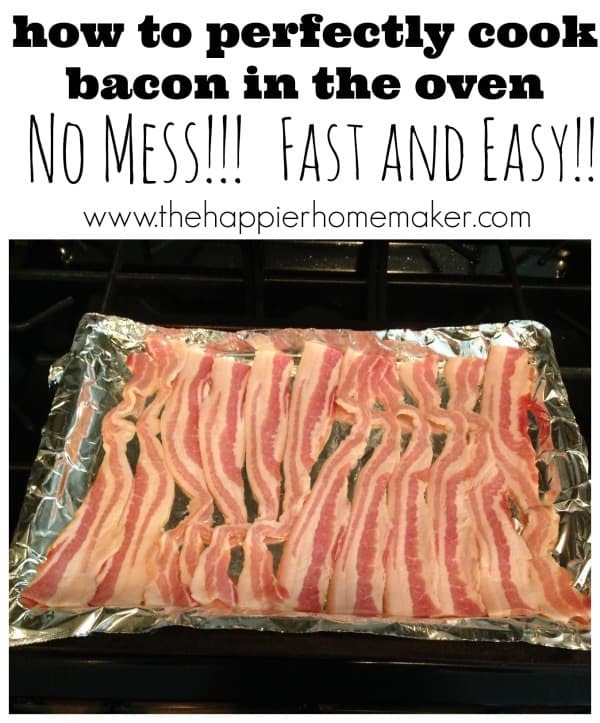 The day I heard about cooking bacon in the oven my whole life changed! I have always wanted crispy bacon but could NEVER do it on the stop top. Oven bacon is the perfect texture AND I can continue to cook while it bakes…no standing over pan cleaning up all the grease that keeps popping and HOPING I pull them off the heat before I burn them. I also use parchment paper and put it on a backing sheet with a rim. I totally agree, it’s been a complete game changer!! My not-so-secret love affair with bacon started sometime before my memory kicked in. I come from a long line of bacon lovers and we don’t try to hide it. About six months ago I made bacon one Saturday morning. It was the extra dangerous kind and I too got popped in the face with a spatter of the delicious grease. I held strong and kept working on getting the bacon done as I needed my bacon fix. Then, as I pulled the last beautiful piece from the pan, it popped once more and got me right in the eye. I felt my way to the sink clutching a dish rag to my face. Fortunately my eye and face were fine, no scars or damage, but one strip of bacon lay broken on the floor. For months now bacon and I have been weary of each other. Buying only precooked bacon and eating it at restaurants whenever possible. Until…today. Today I put uncooked bacon on a baking sheet and popped it in the oven. I am typing this now with a mouth full of warm crispy bacon and we are happy to annouce that the love affair lives on! I followed the instructions word for word but with regular cut bacon and Pulled it out at about 20 minutes and it was perfect. Thank you!! Popping over from Pinterest! Thanks for the painless way to make bacon! 🙂 I do have one thing to offer. although preheating the oven seems to be time consuming, and lack of makes the bacon “better (how is that even possible? Ymmmm) there is a major health benefit to it. Lets be honest, theres some nasty bacteria in raw pork. Try eating some raw, you’ll see 🙂 When you slowly heat up that bacteria, instead of immediately killing the bacteria like a 400 degree oven preheated would, the bacteria slowly get a chance to grow in the nice warming environment of that 100 to 200 degree oven is providing. So where the flavor/crispness may be amazing, for health of your families I would consider the tried and true pre-heat! Thanks for the info MamaBear! But, but, what do you then fry your eggs in? ?